Running is my soul… it has changed my life forever. It has changed me into a confident lady. It has shown me how tough I can be, how strong I can be, how patient I can be( when I have 3km to the finish and it feels like 20km). It is my rhythm, it is my music. Each foot step is a melody to my soul. woooooh I could talk nonstop on this subject, I started walking at a whooping 150kg weight. I decided one day to take a walk outdoors and the rest is history. I must say though it was very interesting at first, the wolf calls I would get from the taxi drivers, the man on construction sights and just passer bys. They would tease me about being so big and trying to run/jog. Those were interesting times. I then attended my first Spar womans race in 2012 Johannesburg and that’s where I fell in love with running….My beautiful love story started form there and since that time I have attended almost every race on Saturdays in Pretoria and some on Sunday in Johannesburg. I absolutely fell in love with running at first and then fell in love with runners. Those are a group of special people, I would say we as runners are a tribe or a clan of our own. At my slowest I would finish last at a race and the support and the cheers I got from other runners. Every time they passed you would hear well done lady, keep going and I promise you those words are aa miracle. They will keep you pushing when you are almost about to give up. 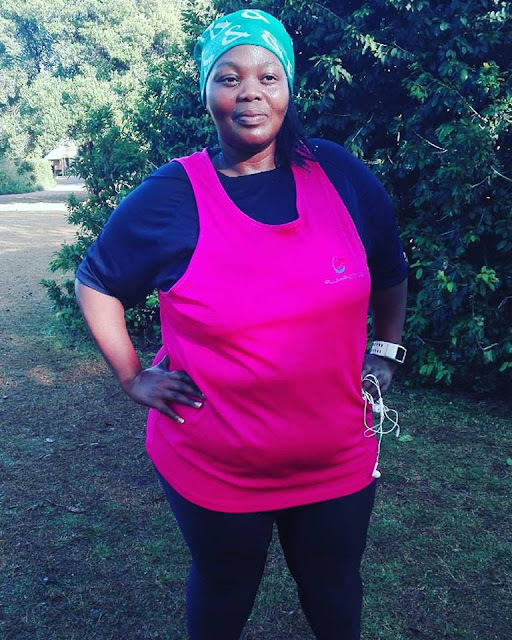 That is why I even love seconding when I am not running so I can just cheer everyone on the road because I know those words of encouragement can do you a world of good. I use a Nike Tomtom watch because that’s what I could afford at the time, I absolutely love it, it has not disappointed me so far but you know with technology. I would love to own a watch with a heart rate monitor one day and then there is the love for music but then again there are the rules about no earphones allowed at races which has taught me to minimise my music or play my music on a loud speaker and irritate everyone who runs next to me. I am planning on having a tshirt printed with the words… If you can hear my music you are going too slow! The one beautiful thing about us slow people, we hardly ever get injuries. We really hardly ever. Even when you have pushed a bit harder you still recover after two days so I have not experienced any serious injuries because I understand that I am on the heavy side of body weight I will not run as much as other people do. I slowly build up a pace that is suitable for me. 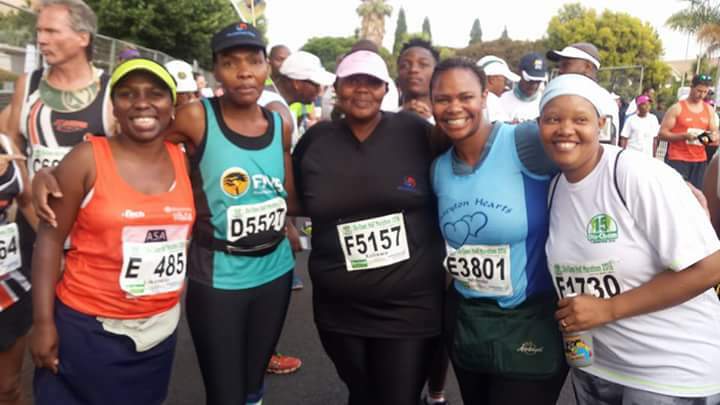 Each day I wake up and run I feel like it is an achievement but my greatest highlight for 2016 was when I attempted to do the Two Oceans half marathon, what a glorious day! What a beautiful moment it was. I have a few friends who have been affected by cancer I always purchase at the pink drive stand at expos! I have absolute amazing respect for woman who run. Woman are strong.. they go through childbirth, period pains and they still run! I would say hey beautiful, you are missing out on the best days of your life!